Chemicals and wax lining in various throwaway containers can cause heart diseases, diabetes, bladder stones, kidney failure and even cancer. The longer you take to drink your coffee, tea or cold drink, higher will be the wax content in your drink thinkstock. In the course of attending a long training course, the only solace for the participants was different mouth watering snacks, served along with a steaming cup of tea. The tea break was the most awaited of sessions as this was the time to for interactions and networking, while holding tightly to that small, seemingly unsuspicious disposable cup of tea. After almost a week, the problem started. Those with sensitive stomachs complained of some discomfort, and began avoiding their morning cuppa. Others laughed it off as an excuse to their diet consciousness. Another week passed, the problem spread. Now, the members of the laughter club also switched sides with non-tea drinkers. Since the snacks and tea were all freshly prepared, who or what was the culprit? The answer lied in that cup only. The wax from disposable paper cups being ingested through hot beverages was probably causing the problems though some remained sceptical. However, many scientific studies have found out similar results. Historically, disposable cups were developed in the USA in 1907 by Lawrence Luellen, a lawyer in Boston, Massachusetts, as these were convenient and addressed hygiene concerns. Disposable cup types include paper cups, plastic cups and foam cups. 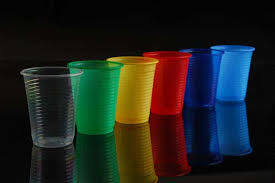 Research indicates that plastic cups may cause 52 types of cancer. Toxins released into food by plastic cups have been linked with heart diseases, diabetes and reproductive development failure. Styrene migration into food has been observed in case of polystyrene or foam cups. This migration increased with increase in fat content of the food and at higher temperatures. Styrene can cause fatigue, nervousness, sleep disorders, reduction in platelet counts and in some cases has been linked with cancer. Considering the hazardous effects of plastic and foam cups, food retailers and restaurants are substituting these with paper cups. Disposable paper cups use high-quality, bleached, virgin paper board. These have to be lined with polythene or wax in order to provide insulation, durability and for preventing the paper getting soaked. The cups have also to be glued at the seams. There are many health concerns related to disposable paper cups as well. The polythene or plastic lining releases Bisphenol A (BPA) and the glue releases melamine into the food. The Journal of the American Medical Association says the BPA is linked to increased risk of heart disease, diabetes and liver problems. Melamine has been shown to be a contributor of weight gain, diarrhoea, bladder stones, kidney failure, and cancer. Not just cups, all other disposable tableware also contributes to the similar risk of contaminating the food due to migration of styrene from polystyrene, plasticisers from PVC, acetaldehyde from PET, etc. This migration of contaminants is dependent on the chemical structure of the migrants, type of food, and its temperature. Even aluminum leaches from the foil into the food depending on the spices in the food, its acidity and temperature. Approved waxes are safe to eat and are added in minute amounts in chocolates and confectionery items. Wax is also used as a coating of fresh fruits and vegetables to retain their freshness. In case of instant noodles and pastas, though there has been lot of hullabaloo on social media that these are coated with wax, manufacturing standards and various tests prove otherwise. In fact, the wax is not digested by our body and is excreted as such. But with no checking measures in place, industrial wax may be used for lining the cups in order to reduce the production costs. So, the harmfulness of paper cups depends on the quality control in its manufacturing. Food-grade waxes can be naturally sourced from plants, petroleum, beeswax, and/or shellac or resin. The Food Safety and Standards Authority of India (FSSAI) mentions that packaging material should be designed such that migration of any of the specified contaminants should not render the food served in it unfit for consumption. In addition to health concerns, environmental pollution due to non-degradable wastes generated, deforestation, water consumption, chemicals and energy in manufacturing of these containers is a major threat. In order to mitigate these challenges, recycled cups are being manufactured. However, these should not have recycled content of more than 10 per cent as it leads to higher concentration of BPA. A research was published in the proceedings of International Conference on Recent Advances in Emerging Technologies (ICRAET – 2016). The study comprised testing wax content and its migration into hot and cold beverages from different branded and unbranded paper cups. Wax content in the inner lining of these cups was found to be in the range of 3.83 per cent to 4.88 per cent. Wax migration was more in case of hot beverages as compared to cold beverages and the amount increased with longer holding time. The longer you take to drink your coffee, tea or cold drink, higher will be the wax content in your drink. Average two cups per day consumption of hot beverage from wax-coated paper cups leads to an annual consumption of wax from 15g to 34g; while for cold beverages, it is 3.64g to 5.1g, for drinking time of 15 minutes. There should be guidelines in place for takeaway containers. Regulators need to formulate guidelines on wax as a food contaminant. Also usage of paper cups should be made discretionary and fast-food joints should be willing to serve in containers of our choice.